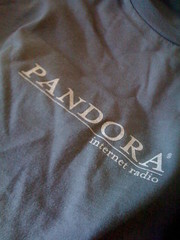 I’m experimenting with music via Pandora Internet Radio. Not an over-the-waves station, but music that streams over the internet. There are dozens of genre stations – choosing “Folk” or “Classical” produces a dozen more choices for sub-groups. There is also an option to create your own station by typing in the name of an artist or song. Last night, I enjoyed the Pete Seeger Channel and the Garnet Rogers station. It’s not perfect – I typed in “Tom Lehrer” and found that my taste in funny songs must be less broad than my taste for folk music: nothing by Tom Lehrer came up, and everything that did come up was neither funny nor pleasant. I erased that channel. Seemingly, one gets about 40 hours a month of free radio over the internet, then audio ads are included. I first tried Pandora on the Blackberry – quite nice – but it was one visual ad after another encouraging me to download ringtones. The science behind Pandora is the most interesting part, to me. The Music Genome Project has been analyzing the components of various performers – voice, style of guitar playing, type of rhythm – to discover the “genes” or basic building blocks of one or another genre. The stations then play songs or performances that share many genes – but with enough variety that one isn’t bored. My experience so far suggests that folk music and classical music have easily discerned genes that work together well – while comedy is more likely to be quirky, and so less susceptible to genetic analysis.